﻿ How many stray cats are in the United States? 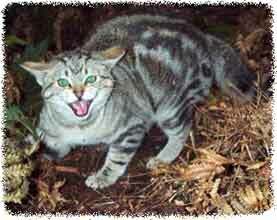 Answer: Estimated 70 million stray, or feral cats, in the USA. When you see a stray cat, does it tug on your heart strings to the point where you wished you could do something about it? Or maybe it's causing problems, fighting, spraying, threatening your pet cat, spreading fleas... So many people walk on by these poor, helpless creatures without any knowledge on how to help them, or any inclination to actually want to. It has been shown that around sixty percent of all households in the United States of America have a pet of some sort. Out of this figure, around 85 million of them are cats. At least a third of this number still is cats that have been acquired as stray or feral cats. But the number of feral cats living out there, either abandoned or born in the wild, is estimated at about seveny million in the United States. When you consider that the average cost of owning a cat is between $600 and $900 per year, the figure doesn’t seem overly high, but when you consider a low income family and the need to feed many mouths on a budget, you can almost understand why so many of these cats are kicked out to become strays, becoming neglected and abandoned. Consider that $900 per year that you will have to spend on keeping a cat. When you compare that amount to the 50 million dollars that it costs the animal control companies and agencies, most of which comes from tax-payers money, you see that neglecting a cat and leaving it to become a stray will cost everyone so much more in the long run, than just finding it a new home, or doing something as simple as getting the poor thing spayed or neutered. The overpopulation of feral and stray cats is fast becoming a serious issue that we all need to put our heads together and deal with. A feral cat is not the same as a stray cat. A stray cat is one that has become abandoned by its owner or has run away. A feral cat is the wild offspring of these strays. When you consider that a breeding pair of cats, when left to their own devices for seven years, can have two litters per year, you have a figure that is around 400,000 kittens born over this time frame. Admittedly, a lot of these feral cats kittens will not live more than a few weeks because of circumstance, even still, you have a very big problem on your hands, whether you think its your problem or not. •	Get your kittens spayed or neutered. This may be a one off high cost, but in the long run, you won’t have to worry about baby cats. Statistics have shown that only around 10 percent of all cats that end up in shelters are “fixed” – a number that should be much higher. •	Provide your cat with identification – micro-chipping or a collar. The majority of stray cats are those that have wandered off and become lost. These identification methods could easily have them returned to their rightful owners. •	Call animal control agencies when you see a stray cat or a litter of stray kittens. One simply phone call from you could have these critters all tucked up nice and warm in shelters, ready to go to a loving home where they will be cared for properly, rather than scrounging on the streets and spreading disease. There is no definite way that the amount of stray cats can be counted, but statistics and estimations have shown that the figure could be around 70 million – many of these could be easily re-homed if the situation were dealt with properly.